It is important to take preventive steps as part of a dental health care routine and that includes having dental x-rays. This is a good way to spot any issues. Here for x-rays, we use digital radiography the most advanced technology in x-rays. These work by using electronic sensors to take the picture and store it. The whole thing is a lot quicker than traditional film x-rays and less discomfort is involved! The speed is quicker because the pictures can be seen right away by the dental hygienist. This means being exposed to less radiation and also having any problems spotted quicker, diagnosed quicker and fixed sooner. This means you will be in less pain as problems are caught sooner so permanent damage can be avoided. You can feel confident that we still have your welfare in mind. Even with the higher safety in the digital method we still are cautious and you are only exposed for as long as needed. When would x-rays be needed? Dr. Moon in the clinic at Crystal Lake, Illinois will usually take x-rays of a patient once maybe twice yearly of the bottom and top teeth. But how often x-rays will be needed depends on a few things like what an exam has revealed, symptoms, age, your dental and medical history or the issue of potential disease. If you have problems with pain we strongly recommend reaching out to us. 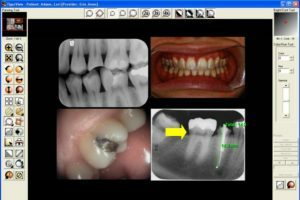 We can offer digital x-rays and an exam with our highly competent dentist.